This edition is the first Icelandic paperback edition of A Thief of Time first published in Reykjavík in 1990 by Íslenski Kiljuklúbburinn. Tony Hillerman's original text in English into Icelandic by Álfheiður Kjartansdóttir. 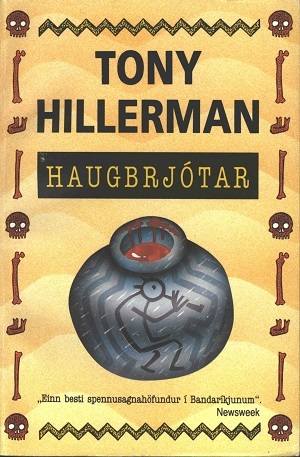 The cover design is credited to Steingrímur Eyfjörð Kristmundsson and adapts the black-on-white Kokopelli ceramic vessel from Peter Thorpe's 1988 cover. Format: Paperback, 19.5 x 13 cm. Binding: Full-colored paper covers with the author, title, a Kokopelli figure, and another abstract figure.